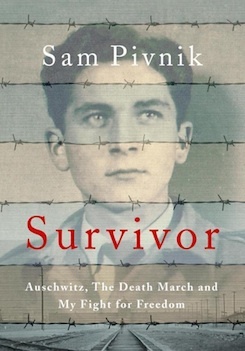 The memoirs of Auschwitz Prisoner 135913 is the memoir of Sam Pivnik, a Polish Jew who survived the Holocaust. Sam's story is extraordinary and unique. He was incarcerated in a number of the Nazi concentration camps, and is one of few remaining Jewish survivors to have worked on the ramp at Auschwitz. He later survived one of the notorious Nazi death marches, and the sinking of the Cap Arcona. Sam's story is profoundly shocking, and contains many new insights into the Nazi atrocities, and the War in general. 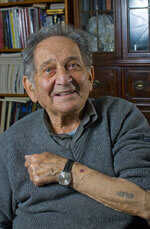 Sam was born in 1926 in Bendzin, Poland, in the Katowice district of Silesia. His father was an Orthodox Jew, and a tailor, who worked out of the three-room flat where Sam lived with his parents, five siblings, and his grandmother. The family lived modestly, but happily. Sam went to school and to synagogue, played with other children in the neighbourhood, and looked forward to summer holidays in the countryside. In 1939, Poland was invaded by Germany, bringing an end to Sam's idyllic existence. The schools were closed, the family business was seized, rationing was introduced, and anti-Semitic violence became routine. One night, Sam watched from his courtyard as flames rose in the distance. In the morning, he found that the synagogue and surrounding homes had been burnt down, and the streets were strewn with the corpses of his neighbours and friends. The town was segregated, and Sam's family were transferred to the ghetto of Kamionka. Gradually, the ghetto was cleared, as Jews were taken away on mysterious 'transportations'. Sam's family hid in the attic for days, but were eventually forced out, and taken by train to the Auschwitz concentration and extermination camp. Sam's parents, three younger brothers, and one sister all died in the gas chambers immediately upon arrival. Another sister followed within weeks. At the age of sixteen, Sam found himself completely alone, fighting for his life on a daily basis using a combination of wit, determination, and luck. Sam worked on the ramp at Auschwitz for four months, watching helplessly as trains packed with Jews arrived from all over Europe. As the prisoners disembarked onto the platform, the Germans would split them into two groups: the young and healthy, and the rest. In late 1943, Sam was transferred to the satellite camp of FÃ¼rstengrube, where he worked as a bricklayer and a coal miner. Here, and at Auschwitz, Sam witnessed a number of revolts and escape attempts. As the Germans retreated on the Eastern Front, Sam was one of many prisoners who were moved to concentration camps in Germany. The train journey took ten days, and the starving prisoners turned to cannibalism. In 1945, Sam was loaded onto a Nazi prison ship called Cap Arcona, which was then bombed by an RAF Typhoon squadron. Sam managed to jump into the sea, as the Cap Arcona and another prison ship were sunk, killing thousands of prisoners. Sam floated, clinging to a plank of wood for hours, while the RAF machine-gunned the water, and the Germans shot any survivors who came ashore. That night, he finally collapsed onto the silent beach, and although he didn't yet know it, his war was over. "Sixty-seven years after the end of the war, by which point the extent of Hitler's death camps have been fully exposed, we've heard it all before, read the book, seen the movie. Yet we haven't. That's the thing about human stories: each is unique. Sam's is remarkable. Not just the death camps, but his escape from them. And that he could build a life afterwards." " An eloquent, deeply intimate account of a Polish teenager’s endurance of successive deathly challenges unimagined in a lifetime.... Masterfully conveys the grim absurdity of the Nazi mentality and the utter dejection of the concentration-camp prisoner."